"Dedicated Professional Engineering, Manufacturing & Design for the Poultry Industry"
Systeng® Automation Systems, a division of Hilley Machine Services, LLC . 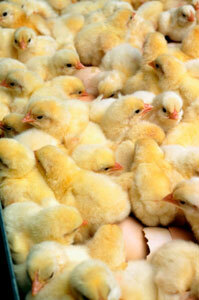 are manufacturers of high quality, reliable hatchery automation systems worldwide. Systeng® equipment is now manufactured in our Danielsville, GA facility. We feature a full line of hatchery automation equipment including chick/egg shell separators, chick counters, tray washers, buggy washers, dolly washers, waste removal systems, box and tray destackers/restackers, paper layers, egg transfer machines, candling machines, carrousels, conveyors and storage systems. We have an extensive inventory of Systeng® and Breuil components available for immediate delivery. Our team of installation and repair technicians stand ready to service your Breuil and Systeng® equipment to keep it operating at peak efficiency. In addition, Systeng® now offers annual service contracts upon request. Systeng® can provide technical assistance and equipment for your existing facility as well as the design and installation of automation systems for new hatcheries.